Firstly, choose the types of herbs that grow year round and those that can grow indoors too. Unquestionably, plant those that you like most to add to your dish. In this case, you are sure to take care of them with passion. After selecting which to plant, we’ll look at how to grow them indoors. Read on to find out. 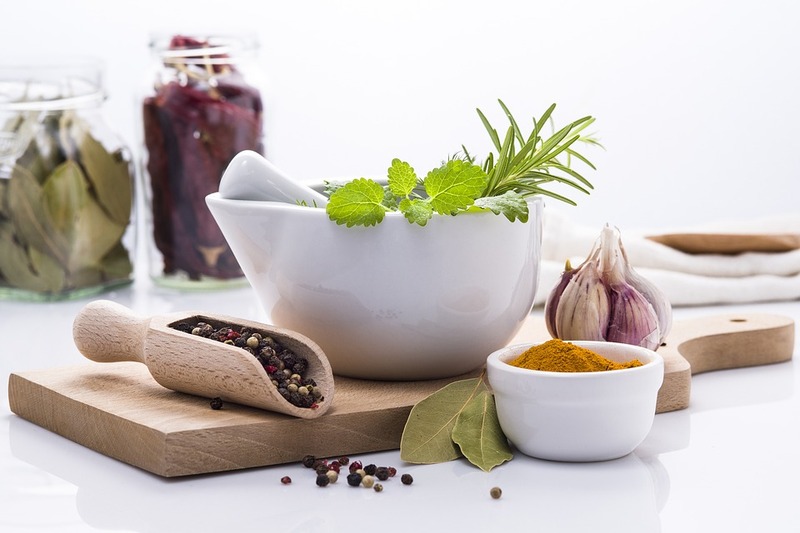 Before going to the how let’s find out if your favourite herb is included in this list. Rosemary is a robust and perennial herb – easy to grow and thrive in containers. Therefore, it is most suited to grow indoors. Since this herb loves the light, ensure that the pot is placed near a window to get at least 6 hours of sunlight. It grows best in a south-facing window. As for moisture, it prefers drier conditions but does not let the plant to dry out completely. Only allow the top few inches of soil to dry out, then water the plant thoroughly. Using well-drained, sandy soil mix helps. Grow your own rosemary and use it to boost your memory. Click here to read more. Thyme is another hardy and a perennial herb. Do note that there are 2 main types of thyme – culinary and ornamental. The 2 most common culinary thyme are common thyme and lemon thyme. As with rosemary, thyme loves full sun and well-drained soil. For this reason, thyme can be planted with rosemary as they share similar conditions. So is watering needs. Oregano is a hardy perennial herb. It grows well in containers indoors when given enough warmth and sunlight. An oregano plant is easy to care for which requires at least 6 hours of sunlight. Best to place the pot in a south-facing window. Plant oregano in well-drained soil and water thoroughly, only when the soil is dry to the touch. This is another herb, besides thyme that can be planted with rosemary as they grow and thrive in a similar environment. Parsley is a hardy biennial herb. Both flat-leaf (Petroselinum crispum neapolitanum) or curly-leaf parsley (Petroselinum crispum) is a good choice as a potted indoor herb. Give it a deep pot because it has a long taproot. Parsley plant grows well in either full-sun or part-sun condition. Thus, the pot can be placed in an east or west-facing window. It grows its best in moist soil. Cilantro, also known as Chinese parsley is an annual herb plant. Being delicate, it is not the easiest herb to grow. But it does grow well once a conducive environment is achieved. It prefers cooler temperatures with full sun four to five hours per day. In this case, the best option is in an east-facing window. Good drainage is essential to keep the soil regularly moist, not soaked. Use light, airy, sandy soil mix to increase drainage. Always check the surface of the soil to make sure it is dried out before watering. Thorough watering is more important than frequent watering. Basil is grown as an annual or short-lived perennial herb. It is a good choice to plant indoors given plenty of sunlight. Place the potted basil in a full-sun windowsill to get at least 6 hours of sunlight. This herb does not like sitting in water. Therefore, choose a well-draining soil and allow the soil surface to dry out between watering. When doing so, ensure to water at the base of the plant to avoid showering the leaves and stems. Chives, a grass-like perennial herb can grow continuously throughout the year given a conducive environment. This is one of the easiest herbs to grow. Chives grow well in full sun. Thus, it is best to place potted chives in a south-facing window to receive at least 6 hours of sunlight per day. Water the plant frequently to keep the soil moist but do not over-water and ensure the soil is well-drained. Mint, a hardy perennial herb grows well in both cool and warm climates. It is the easiest herb to grow, but most difficult to contain – being an invasive plant. Therefore, best to grow mint in pots. Two most common mint varieties to grow indoors are peppermint and spearmint. This herb prefers full sun to partial shade. Place the potted plant near a sunny window to receive at least 5 hours of sunlight per day. Regular watering is needed to keep the soil moist at all times while ensuring it is well-drained. Mixing sand into the soil increase drainage. Click here to read About Mint Leaves and its benefits. Here you have it – 8 Herbs that Grow Year Round. Does it include your favourite? Yes, no or most of them. A couple perhaps? In any case, if you love fresh herbs with your cooking, you will certainly love to have them conveniently at hand. What better way than to grow them yourself? With some planning and a little effort and care, you will get to enjoy delectable fresh herbs whenever you need them. Generally, all it takes is a bright space and pots or containers with well-drained soil. Also, be mindful of the watering needs. Last but not least, some tender loving care for the plant. Once you have chosen which herbs to plant, gather all the materials. Soil – potting mix and compost. Pots or containers – preferably those that have holes at the bottom to increase drainage. Tools – use a serving or tablespoon instead of a garden spade as it is easier to work around in a small pot. Not forgetting the best gardening tool – your pair of hands. Don’t be afraid to dirty them. Label – if you decide to grow a variety of herbs from seeds, it is a good idea to label the pots. Fill pots with a mixture of 2 parts potting soil with 1 part of compost. Some potting mix includes lightweight ingredients such as perlite or vermiculite which help to loosen and aerate the mix. Also, consider adding a thin layer of crushed eggshells in between. This helps to retain moisture in the soil for herbs to absorb nutrients encouraging grow. Grow indoor herbs from seeds can be time-consuming if not challenging when you’re new to this. 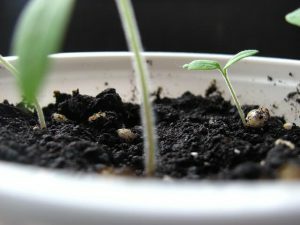 Transplant herb seedlings are the fastest and best option for a newbie. On the other hand, grow from cuttings can be more satisfying when you watch them grow. Besides, save on spending. Herbs that can propagate well from cuttings are rosemary, thyme, oregano, basil and mint. It is best to start with healthy matured plants to ensure success. If using herb stalks from the grocery store, select the sturdiest. Select stem segments that are tender – usually green and not woody. Make an angled-cut below the leaf node at about 6 inches long from the tip of the stem. Place cuttings into a small jar of water. Cover it loosely with a plastic bag to create humidity. Remove the bag if there is too much moisture. Place the jar in a well light area but not direct sunlight. Change the water once a week or when needed. In 3-4 weeks, roots will be growing from the node area. Some may take up to 5 weeks. When the roots are about 1-2 inches long, plant them into the prepared pot and gradually expose the plant to full sun. Care for these herb plants according to their needs as mentioned above. Ensure the seedling is strong enough to be moved. They are ready once the second set of leaves have grown or when they are about 3-4 inches high. Water the seedling about 2 hours before transplant. This will loosen the soil to make it easier to remove. The water should just be enough to moist the soil. Make a hole in the prepared pot. 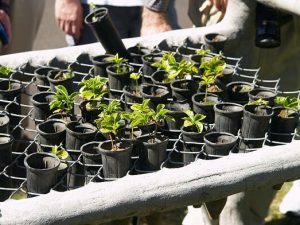 To ensure that the seedling fits in, put the nursery seedlings pot or pellet into the hole. If it fits, it is good. Remove the seedling from the pot by placing the hand over the soil and seedling in between fingers. Turn the pot upside down and shake gently to dislodge. It is easier if the seedling is in a pellet. Simply peel off the skin. Place the seedling together with its soil into the hole of the prepared pot. Pat it down lightly, not compressed to ensure the roots continue to grow. Water thoroughly at the base of the seedling. Gradually expose the plant to full sun and care for its sunlight plus watering needs accordingly as mentioned above. While most perennial herbs (rosemary, thyme, oregano, basil and mint) can grow indoors by propagating from cuttings or transplant from seedlings, parsley and cilantro are better to be grown from seeds. Cilantro is a short-lived annual herb that doesn’t like to be repotted. While parsley plant can be bought from the nursery, you will get more plants for less money planting from seeds. Soak the seeds in water for 24 hours to speed up germination. 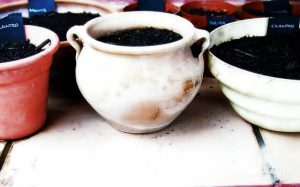 Using the pot prepared earlier with potting mix and compost, sow seeds 1-2 inches apart, about ¼ or ½ inch deep. Water thoroughly and place the pot in a warm and sunny area but not direct sunlight. Keep the soil evenly moist but not soggy, until the seeds germinate which usually takes about 2-3 weeks. Sometimes more. When seedlings are about 2-3 inches tall and there are too many, thin them out. Use scissors to snip off near to the soil line. Do not pull them out as this will disturb the roots of nearby seedlings. Place the pot where it receives at least 4 hours of sunlight per day and water thoroughly when the soil is dry to the touch. Herbs grown indoors will be less abundant than grown outside in the garden. Nevertheless, with added care and attention to soil combination, sun exposure, watering needs and tender harvesting, you will be rewarded with flavourful and aromatic herbs year round. Clay pot is porous, enabling the soil to breathe and retain warmth much better. On the negative side, it is susceptible to breakage and dries out rapidly. Plastic is lightweight and better for retaining moisture. Although it does not break, it will become brittle when exposed to the elements for a long time. Metal container is durable and usually comes in the form of old tin cans or water cans. It does not break and lasts a long time. Additionally, vintage tin cans double as a decorative piece on your windowsill or kitchen countertop. For the DIY or craft enthusiast, this would be a nice project decorating recycled tin cans. In fact, herbs will grow in most type of pot or container as long as it has good drainage. Herb pot should be at least 6 inches in diameter. While a deeper pot at about 10-12 inches deep is needed for parsley because of its long taproot and basil which has an extensive root system. It is a mistake to use garden soil to grow potted herbs. No doubt rich in nutrients, garden soil is too heavy and will impede both drainage and aeration. Furthermore, the soil may contain insects, weed seeds and disease organisms. 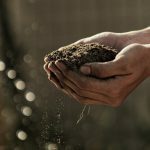 Use 2 parts sterile potting soil to 1 part compost as mentioned earlier in this article. Herbs thrive with at least 6 hours of sunlight daily, while cilantro, parsley and mint can do for 4 hours. This may be difficult to achieve during winter months. Also, depending on where you reside, your home may not get enough natural light. In these cases, the use of Grow Light can help. Click on ⇒ Grow Lights to check out my review, from the most economical and affordable units to various types that suit your needs. It is best to water thoroughly than frequently. Thoroughly means to water until the water comes out from the drainage holes. Allow the topsoil to dry out between watering. Suggest planting herbs in separate pots. If in one container, plant variety of herbs that share same watering needs. Growing herbs in pots need a bit of help in terms of nutrients. Container limits the range of the root system and the plant cannot absorb as much soil nutrients as it does in the garden. There are many types of fertilizers that will work for indoor potted herbs. It is recommended to use water-soluble fertilizer or those that can be dissolved in water. These could be concentrated fish emulsion or packaged granular that must be added with water or dissolved in water before applying. Regardless of which, the fertilizers are to be applied at ¼ of the packaging’s recommended dosage because it will be too concentrated for potted herbs. Fertilize the herb plants once a week only during the periods when herbs are actively growing. Mix the fertilizer at a strength of ¼ of the recommended dosage. Follow these growing tips and you will have your own home-grown herbs any time of the year. 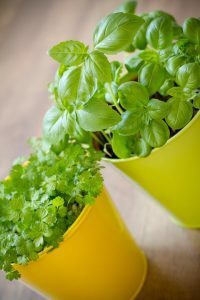 The question of how to grow herbs indoor year round has been answered and it isn’t as difficult as it seems. Choosing the herbs that can grow indoor and year-round will increase your success rate. Coupled with the growing tips, you’ll have a continuous supply of fresh herbs within reach. Besides, these herbs plants are absolutely beautiful as ornamental plants. I would suggest that anyone who is new to growing herbs indoors to start off with transplanting nursery-bought seedlings. Once familiar with taking care of the plants, try propagating from cuttings. When you have successfully nurtured the seedlings to matured plants, you will have plenty to propagate. Currently, I am propagating mint from stems of fresh mints bought from the grocery store. Doing quite well I must say. Choose your favourite herbs today and let’s get growing! Here is an overview of the Best Herbs to Grow Indoor and How to Care for them for your easy reference. This Herb Garden Starter Kit will help kick-start your herb gardening quest. Click here for more Indoor Herb Garden for Beginners. If there are any growing instructions or tips that I have left out, I will be more than happy for you to share with us. Please leave them in the comments section below. Conversely, if you need any help in growing your indoor herbs, I will do my utmost best to help. Any growing experiences that you would like to share with us are most welcome too. Glad to have found this site. My wife and I own and operate a food truck, BBQ. Our homemade cole slaw requires using Cilantro and we like fresh although sometimes we cannot find the really nice looking, fresh product. Growing it ourselves has crossed our minds but never thought we could. You have inspired us to try this on our own. You mentioned that Cilantro like cooler temperatures. How cool? We live in the Midwest and we experience from one extreme to the other. Any other recommendations? I am glad this post has inspired you to grow your own cilantro. I love cilantro for its flavor but my family dislike the taste. Cilantro thrives in moist humid conditions with full to part sun. It does struggle in heat. So, try to find a shady area in the heat of summer. Also, a matured plant will bolt – flowering and go to seed (coriander) when the weather turns hot. Consistent harvesting will encourage new leaves to grow instead of flowering. Rotate the harvesting area as you go. To have continuous supply, sow seeds every 2 weeks. Suggest to grow them in containers. This will enable you to bring the potted herbs indoors during winter, out to the garden in spring or find a shady area when the heat comes. I hope this information can help you grow cilantro all year round. Should you need further help, please feel free to ask. Do drop by again to let me know how it goes. Wish you continuous success in your food truck business! Thanks for dropping by and the positive comments Leigh. There are many types of grow lights to choose from on Amazon. 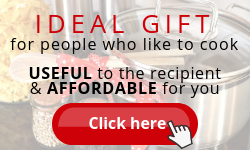 Depending on your needs and budget, I am sure you can find one that is suitable. I love this article! 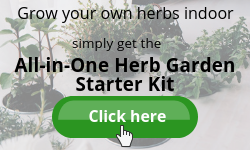 I am a sucker for How-to’s period, but finding one of this quality on how to grow herbs all year round is a gold mine for a vegan like me. 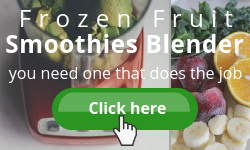 We all know intuitively that living foods are healthier for us than processed (dead) foods. Being able to use fresh (oh yeah, and local) ingredients is ideal in many respects. I can’t wait to get started with the rosemary. It will go great in my “eat” loaf. Thank you Sharon! You are most welcome Neil. Am glad this article has given you much information to get your rosemary herb started. This post is so thorough and informative! Thank you Sharon. We grow all of these herbs in our garden (it’s way more economical than buying little packs from the grocery store) but i’m going to use some of your tips to try to keep them growing indoors during the winter. Our plants grow a lot in the warmer months so I cut a lot off and stick it in the freezer (not sure if that’s good or not but it’s been working for me) as it all dies by the time winter comes around. I’ll definitely be using your propagating and growing tips this winter and look into getting a grow light. Growing herbs all year round definitely has its advantage. I am glad you found this article informative and useful. 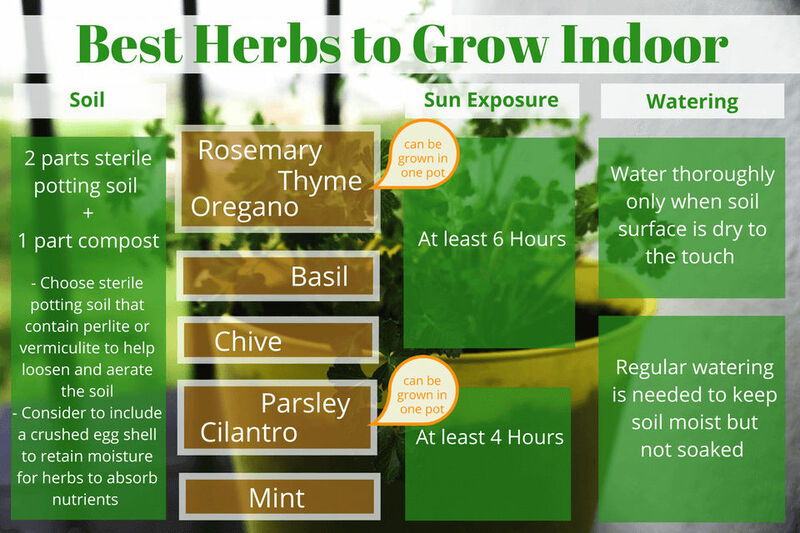 Hope it helps get your herbs growing indoors. Thanks for your article which is very informative. The herbs grown inside, give a fresh aromatic air. Moreover, in India Holy Basil is pot grown in the courtyard and people worship it early in the morning. It is known that it gives good health.Similarly, your article gives great insight about pot growing herbs in pots indoors. Thanks for your positive comments and sharing the cultural use of basil in your country. It is good knowledge. Drop by again periodically for more articles about herbs and spices. I have considered growing herbs indoors; but I don’t have the right lighting for growing plants. I only have two windows that don’t have a heat run underneath. The plants hate the heat from the registers and dry up and die. I also have narrow window sills. Is there a way to grow herbs with grow lights? I have been starting to look into the possibility of using grow lights for my house plants. Your choice of herbs was wonderful. It included many of my favorites. I have just gotten used to using the dried herbs; but I would love to try the fresh if I could grow my own. You explained everything very thoroughly from start to finish in an easy to understand way. Thank you for a great and helpful post. The use of grow lights can definitely help when we can’t get enough of natural light where we reside. There are many good choices on Amazon. Do check it out. There is nothing better than fresh oregano when cooking Italian cuisine! I really appreciated the part of this article where you suggested where to place the pot and how to plant it. I didn’t know it could be planted with rosemary as well – thanks for the great tip(s). Looking forward to reading more here in your blog. Thank you for dropping by Jason. I am glad that you found the information in this article useful. 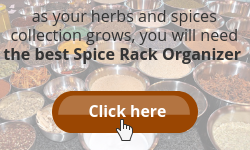 Do visit periodically for more articles on herbs and spices. Whats the best way to get artificial light if i cant get natural from a window sill? I’m glad i found your page. 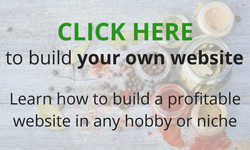 there is alot of good info here and it’s just what i am looking for to get started on my growing. I am glad you found this article helpful. There are many health benefits related to each herbs and growing your own allows you to conveniently use them year round. If you can’t get enough of natural lights, try using LED grow lights. There are many choices available on Amazon. I found this Ppunson Dual Head LED Grow Light to be very functional and affordable to start off with. Else of that, I’ve been trying different relaxation tretments with herbs like aloe vera and it worked out pretty well!! What can you say about aloe vera? Is it easy to grow?? And Thyme is one of my personal favourites!! I even see that some people use it in their food!! Perhaps you should grow your own thyme since it is your favourite and you’ll get to consume it year round. Years back, I have a pot of aloe vera but it didn’t grow very well (skinny). Probably it was a bit neglected. My bad since I don’t use it much or at all. I left it behind when I relocated. Now, looking at my neighbour’s aloe vera patch which she planted in a raised bed, I really envy her. Giant aloe vera. I said giant as a comparison to my skinny plant. I don’t have much experience growing aloe vera except knowing that they don’t like over watering. Make sure the soil is dry out completely between watering. And they grow their best when given lots of light. If there is any other way that I can be of help, feel free to drop by again. This is extremely helpful! I’ve been trying to find out which herbs would be best to grow in my apartment. 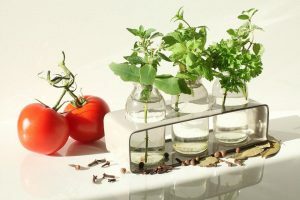 I only want to grow maybe three different kinds because I know I’ll go over the top if I let myself… Which herbs would you say are the most practical to grow? I don’t have any preference with them when cooking, but what do you usually use most? Thanks for dropping by, Sara. I love mint, growing them in a pot and use them for brewing tea. It is nice to have after dinner before going to bed. Basil is another herb that I grow using them for my green salad. Loved the aroma. These 2 herbs propagate well from cuttings. Initially, I bought them from the grocer. Now, I have my own. You may do the same, that is to propagate, for rosemary, thyme and oregano. Moreover, these 3 herbs can be grown together in one pot as they grow and thrive in similar environment. Convenient to care for. Hope these help you to make your decision which herbs to grow. Please feel to contact me should you need further assistance. I never thought of herbs though, this might be a great way to start. Thanks for dropping by, Christopher. 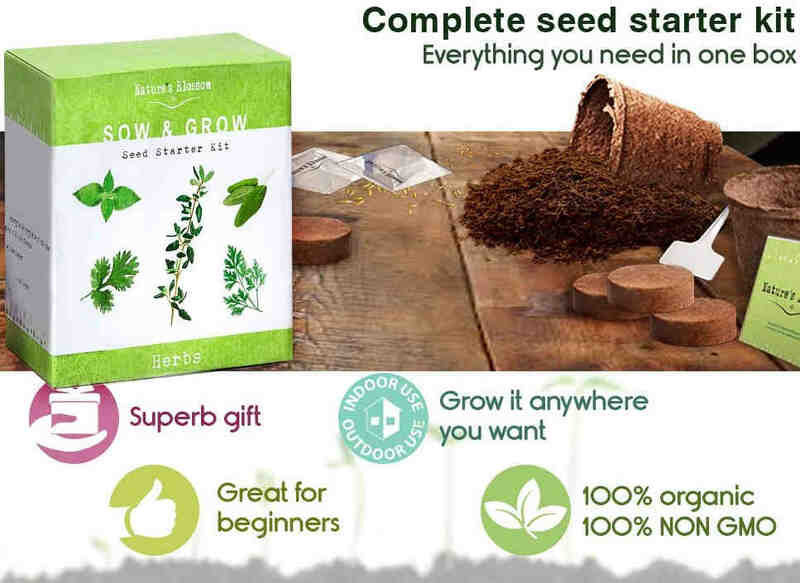 The herb garden starter kit is a great start for your son. The whole family will have fun. My wife is a great cook and uses fresh herbs whenever she can get them at the local market. The step-by-step guide that you have takes the intimidation out of starting and we have some great sunny windows that will make good places for a herb garden. Now I can surprise her with a gift that keeps giving year ’round! Thanks for writing this guide in a thorough and easy to follow fashion along with the sources needed to get started. Thanks for the positive comments, Jim. I am glad you found this article helpful. Pretty sure your wife will love the herb garden starter kit. I grow herbs all year round and as you said one of the most important factors for year round growing is plant selection. I adore basil, mint and rosemary. They keep the room so fresh that I don’t ever want to get out of there! And I didn’t know that the holes under the containers were to increase drainage. Pretty helpful infrmations that I’ve gained from your article! Thank you!!! Great! I am delighted that you are already into this, Tyler. Basil and mint are my favourite and I have them year round. 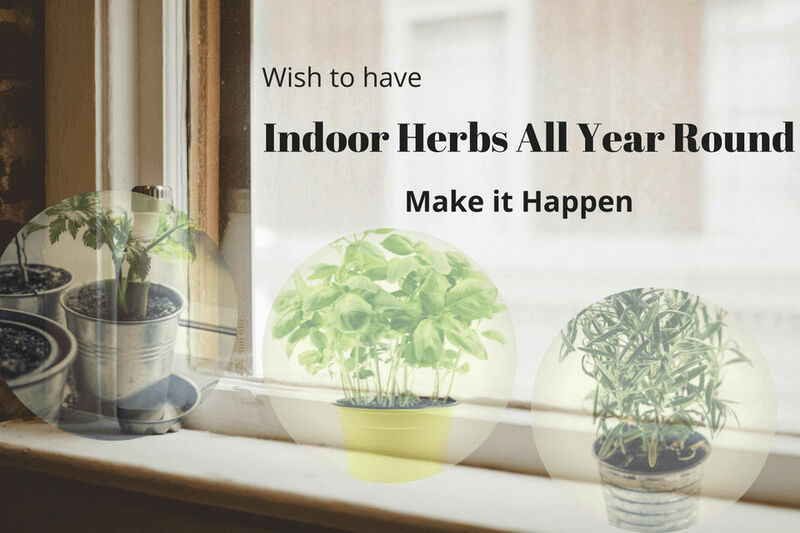 Glad that you found this article useful and provided you with additional tips for growing herbs indoor. Very useful post for me. I am planning to grow cilantro this summer in my window pot. Although I have grown them in winter and got good result, but not sure if I will get that either in humid summer here. Got encouraged form your post, Thanks! Are there different varieties in Cilantro? Which is the most easy variety to grow at home? I am glad that you found this article useful. The variety of cilantro includes Santo, Jantar, Delfino and Calypso. It is recommended to grow Calypso where summer is hot because it is the slowest to bolt, or send up flower stalk. Cilantro leaves become finer and harder to harvest once the plant bolted. Remember to give the plant regular, steady water, and mulch the soil to keep the surface cool. All the best! Let me know if you need further help. 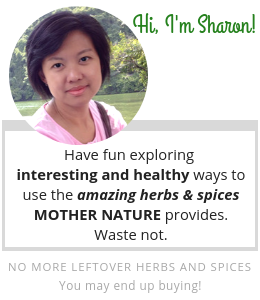 Hello Sharon, I really, really love the step by step Propagating Guide, the growing tips, so helpful for anyone who want to grow herbs all the year around,I am glad I found your site. The presentation of your article is very well done and give to me a lot of inspiration. I am glad you like the article and find it helpful. Start growing your own herbs now. The herbs are more aromatic when freshly picked and used on the spot.